I’ve been using BCA packs for several years now, so I was excited to get my hands on the latest Stash Alp 40 pack. I am extremely particular when it comes to ski packs – a good ski pack has to carry well both when it’s nearly empty and stuffed to over-flowing, it has to strike the right blend of durability and light weight, and it has to have a user friendly diagonal ski carry. After many days and thousands of vertical, I can honestly say that the latest Alp 40 from BCA is one of the best packs I’ve ever carried. BCA kept all of the features from their previous models that were so popular, for example: the dedicated probe and shovel pockets, the Nalgene compatible hydration system, and just the right amount (and location) of pockets. The real kicker is in the upgrades for this model. BCA used a thicker, more durable fabric for this version, but kept the empty pack weight at less than 3.5 lb. In my experience, this is about as light weight as you can go for a pack that you plan to strap sharp objects to (like skis and a mountain axe). The suspension system is also vastly improved in this model. The shoulder straps are wider and use new materials, and the back panel has more support and padding, making for a very comfortable carry. The side access zipper is also vastly improved. 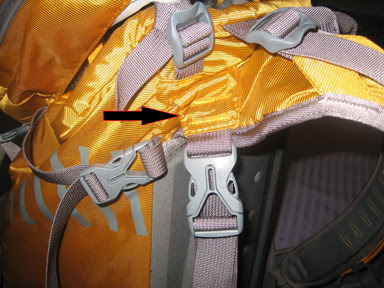 In this model, the zipper joins the padded back panel to the rest of fabric of the pack itself (see photo). This is a much more user friendly design. Another new feature is the roll-top closure – similar to what you find on a dry bag. At first I was a little skeptical, but after a few days where the wind chill was pushing -30 °F, I found the roll top design to be easier to use with full expedition mittens than a traditional zipper or pull-cord. Now that I’m used to the roll top, I’m starting to wish some of my other packs had this feature. The final improvement that sealed the deal for me was the re-designed diagonal ski carry. I spend many (many) hours in the spring with skis strapped to my back climbing up steep couloirs. Over the years, most of the “injuries” that I have sustained were from the skis on my pack – they would either hit me in the back of the head if carried “A-frame” style or hit me in the calves if carried vertically. BCA’s previous pack designs have included a diagonal ski carry, but because of the location of the attachments skis would usually end up carrying closer to vertical, especially if the pack was not stuffed full. In the new Alp 40, the top attachment for the diagonal carry has been integrated with the attachment point of the shoulder strap. This makes the ski carry truly diagonal and actually quite comfortable. See you in the backcountry. Want to improve your backcountry skiing skills and gain confidence in decision making in the mountains? Join CMS for a L1 Avalanche Course or a day of guided backcountry skiing this season.